Story time and play time are one and the same with this Read & Play set from Go! Go! Sports Girls. A fun and educational way to promote self-appreciation and the benefits of daily exercise, smart eating and sleeping habits, the books and dolls in the series encourage all children to dream big and work hard to achieve their goals - and have fun while doing so. "We love that The Go! Go! Sports Girls encourage creative play through sport and now the dolls come to life with books in the new Read & Play sets. The six books tell the story of how each girl learns her new sport and how sport plays a role in her social emotional growth. Readers will also pick up useful information about their new sport as they read the story. The Go! Go! Sports Girls Read & Play sets promote active play and empower girls, much needed themes on today's toy shelves." Swimmer Girl Suzi is a soft, 14" plush cuddle companion with thick, richly textured yarn hair. She comes with her very own goggles, backpack and towel. In her illustrated storybook "Winning Strokes" Suzi has to race against her big sister Hana! Find out what happens, and learn fun facts about swimming, too! From the full-featured range and roomy kitchen table to the modern microwave and fridge, this key lime kitchen set will add a bit of fab and lot of function to your dollhouse! Cut from natural wood and finished with safe, water-based paint. Includes 9 pieces of furniture in all, including a combined oven and prep area, and is perfect for ages 4 and up. From the polka dot shower curtain to the simple yet artful basin sink, this lemon meringue country bathroom set will add a little rustic, homespun charm to your dollhouse! There's a ton of tiny details packed in, too, from the silver curtain rod that lets you really draw the shower curtain, to the hot and cold knobs on the tub, to the mirror that really refelcts! Cut from natural wood and finished with safe, water-based paint. Includes 4 pieces in all, and is perfect for ages 4 and up. Add some fabulous flair to your dollhouse with this tangy and tasty Dazzling Dining Room Set from Imagination Generation. Equal parts fab and functional, each piece is dressed to impress. Move in the glamorous aqua colored chairs next to the bright red table, they go perfectly with the aqua and red cupboard! This is one distinctly funky fresh dining set you won't be able to get enough of. Show off your decorating skills by displaying trinkets on the hutch or stash dishes away in the cupboard Just don't forget to set the table before dinner! Your doll family will love their new stylish furniture, so don't delay; treat your dolls to this amazing dining room set today. This Dazzling Dining Room Set encourages children to play creatively and teaches spatial reasoning when they are trying to see where the items in this set fit. You may have a future Interior Designer on your hands! As with all of our Imagination Generation Playsets, our products are made from natural, sanded cuts of wood. They are finished with safe, water-based paints as well so no worries regarding your child's safety. Show off your dollG++s most stylish pieces with this cute, wooden dress rack. You can display her fancy dresses and flashy costumes on the 6 wooden hangers. Even better, thereG++s plenty of room for shoes and accessories in the storage basket below! All of her outfits will be ready and wrinkle-free when itG++s time to get dressed! Our classic wooden doll dress rack is the perfect addition to any doll furniture set and is compatible with clothes and accessories from major brand name 18G+- dolls. Finally, an easy and practical way to teach your little one to put their clothes away! Made from solid cuts of natural wood and decorated with safe, water-based paints. Need to make your dollhouse a little less lonely? 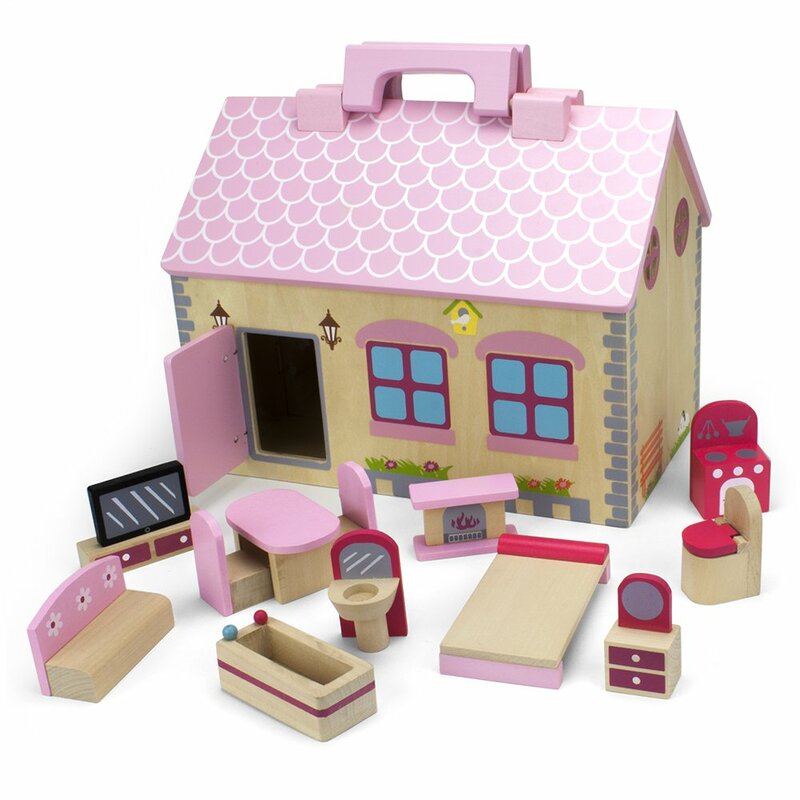 Want to liven up your playtime with a whole family of dolls you can play house with? Well look no further than My Doll Family from Imagination Generation. The gang is all here with Grandpa, Grandma, Mommy, Daddy, the kids and baby sis! 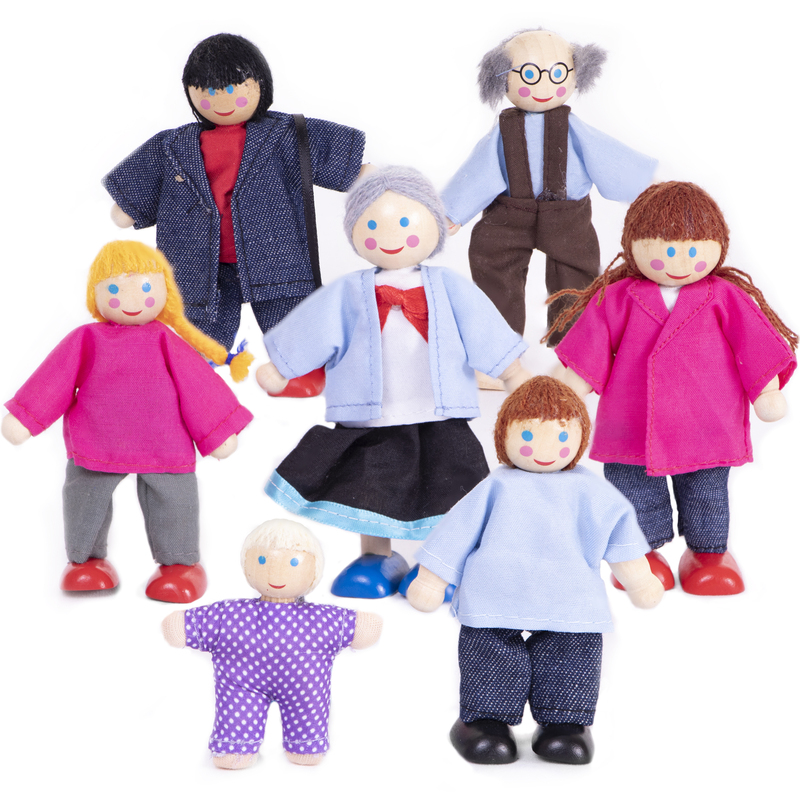 You'll have so many options to setup home life scenes and play imaginatively with these fantastic wooden dolls! Each figure is posEable with multiple points of articulation; meaning you can make them walk, sit, sleep, stand, bend their knees and elbows, and so much more! They're also compatible with most doll houses on the market as well so you'll be able to find a home for them no matter how big or small! Parents will love seeing their children interact and mimic the scenarios shown in their own households within the context of imaginary play. Play with them to encourage reinforcing of your own daily routines. Be sure to check out all our other Imagination Generation playsets to maximize the possibilities for homelife scenarios. These 15 Little Professionals are ready to embark on exciting career paths! 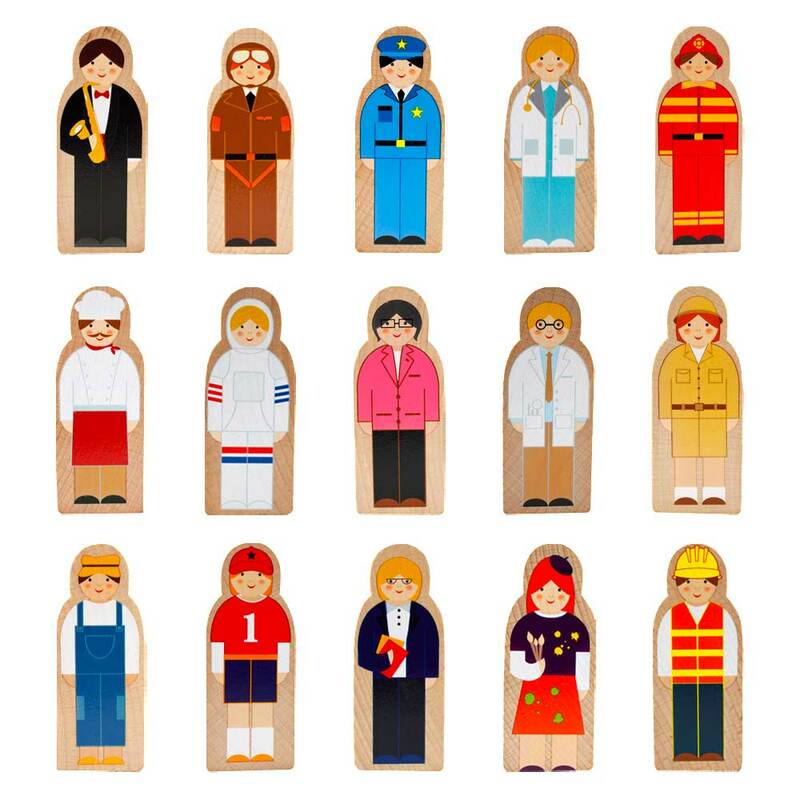 From artist to chef to zookeeper to athlete, these characters are perfect for dollhouses, wooden play sets and train tracks, or all on their own. Cut from solid wood, each Little Professional stands about 3 inches tall and 1 inch wide, and features bright, long-lasting screen-printed colors. Our wooden figures also feature securely-fastened backstops, which keeps them standing tall during play! Each Little Professional's career is clearly labeled on their back and bottom for quick identification. Included in every pack of Little Professionals is a helpful info sheet that encourages open-ended play and role-playing. Not only does each Little Professional have a name, like Mary the Mayor or Forrest the Firefighter, but they each have a short biography that reveals a little bit about what makes them tick! Lots of great details for aspiring storytellers! In addition, every info sheet includes 4 suggested Ways to Play to support your child's learning. Star light, star bright, I've tucked in my babies for the night, one of the the top, high as a kite, the other below, snuggled up tight. And if my babies start to gry, I'll sing them little lullabies, like "Hush, Little Baby" and "Rock-a-bye," and soon they'll start to close their eyes! 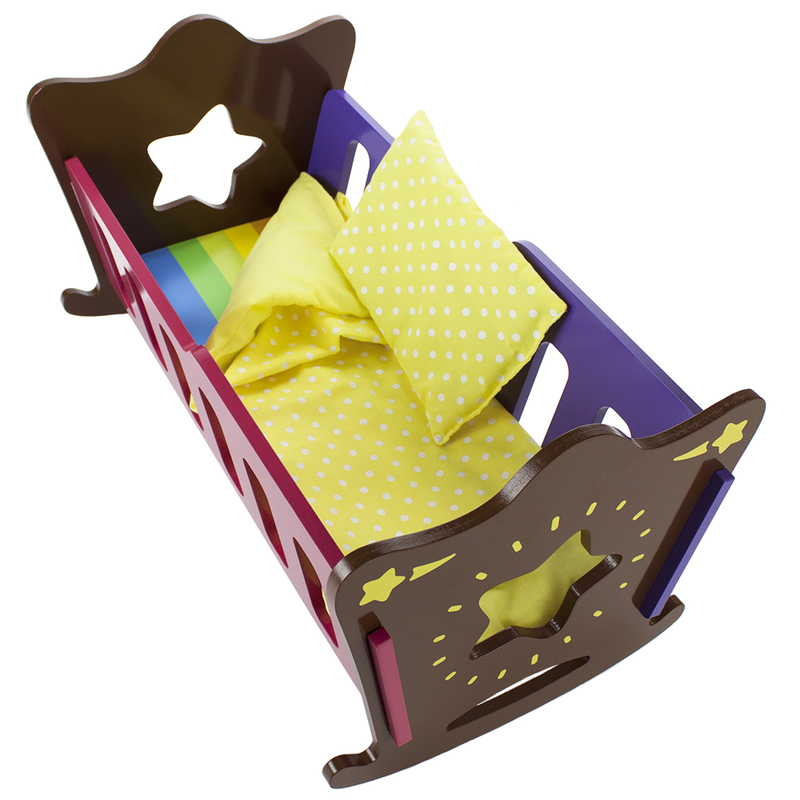 The Star Bright collection of wooden doll furniture from Imagination Generation features bold, chocolate accents and bright rainbow highlights. It's a decidedly different look for doll furniture! Comfortably accomodating a wide range of 18" dolls, inlcuding American Girl, Kid Kraft, Our Generation, Madame Alexander, Best Friends Club, Journey Girls and more, these comfy Bunk Beds are the perfect vessels to sail your favorite dolls off to dreamland. Just lay your doll down, pull up the covers, and tuck them in! And if your dolls decide they're too big for bunk beds, you can even separate the beds out into twin beds. 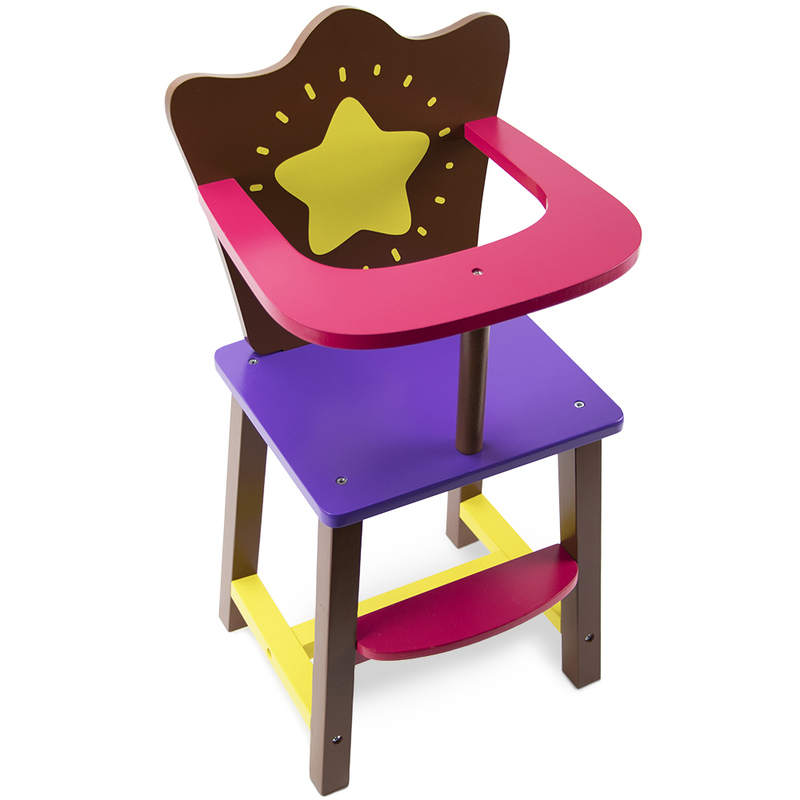 Also available in our Star Bright line: a rocking Cradle, and a High Chair for feeding time! The Star Bright collection of wooden doll furniture from Imagination Generation features bold, chocolate accents and bright rainbow highlights. It's a decidedly different look for doll furniture! Comfortably accomodating a wide range of 18" dolls, inlcuding American Girl, Kid Kraft, Our Generation, Madame Alexander, Best Friends Club, Journey Girls and more, this colorful high chair is the perfect addition to pretend mealtimes. Just place your doll in the seat, get your food ready, and turn your spoon into a plane! Also available in our Star Bright line: Bunk Beds that turn into two twin beds, and rocking Cradle. First, meet Joseph, the carpenter. Inside you'll find his wife Mary, the mother of Jesus. Keep going to uncover the Three Wise Men with their gold, frankincense, and myrrh. At the center you'll find baby Jesus, the new born King! Watch as little ones improve fine motor skills and problem-solving skills while learning about the birth of Jesus. 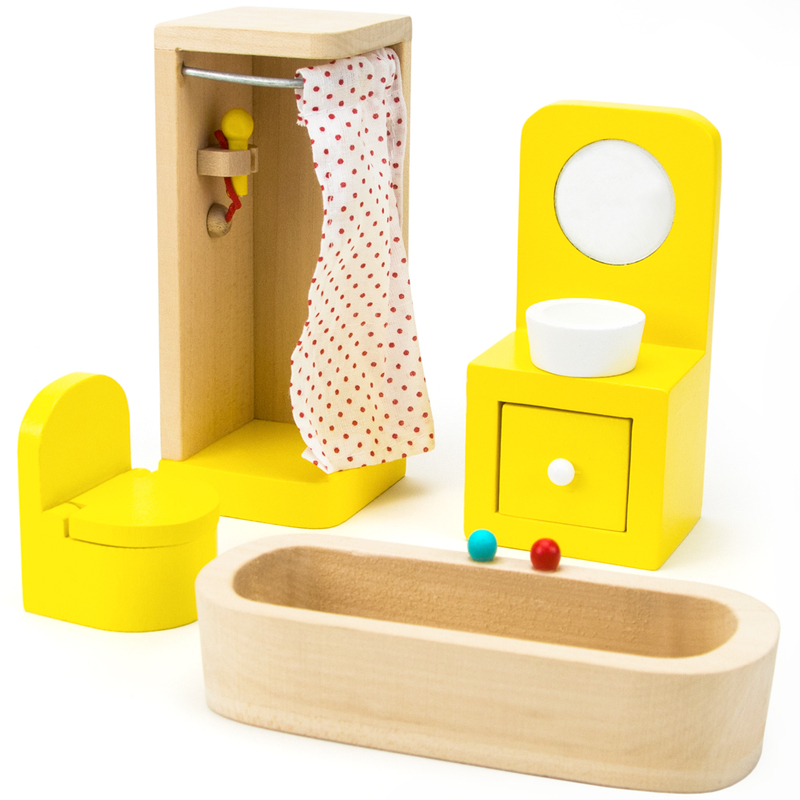 Nesting toys are great for little ones to improve visual and spatial perception. Watch as they put together and take apart these nesters each holiday season to unravel the story of Christ's birth. They'll get to know the characters in this biblical story through imaginative play. 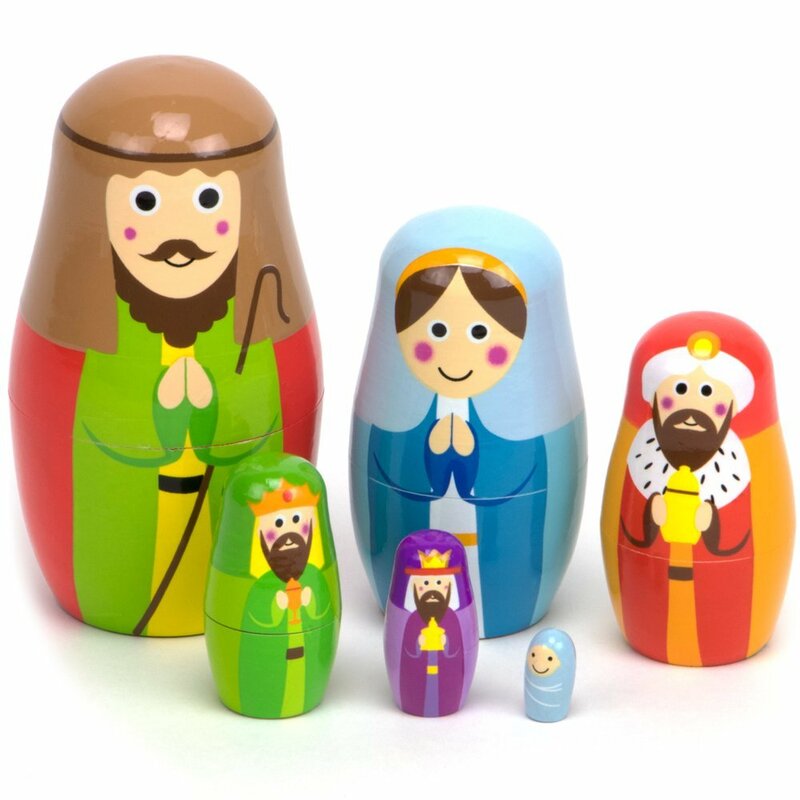 These wooden nesting dolls are great for Christmas presents, stocking stuffers, Sunday school toys, or to decorate the house with during the holidays. Made from natural cuts of wood and decorated with safe, water-based paints. This craft cottage redefines what it means to be a "mobile" home! Pack up your furniture and dolls, grab the handy handle, and the Take-Along Country Cottage is ready to go! The cottage's exterior is rustic and cozy, with a quaint garden, picture windows, and a birdhouse. Inside, there are four rooms to decorate with thirteen pieces of sweet, pink furniture cut from natural wood and finished with safe, water-based paint. Star light, star bright, I've tucked in baby nice and tight. I wish she may, I wish she might, dream bold and bright dreams tonight. And if my baby starts to cry, I'll sing her little lullabies, luke "Hush, Little Baby" and "Rock-a-bye," and soon she'll start to close her eyes! 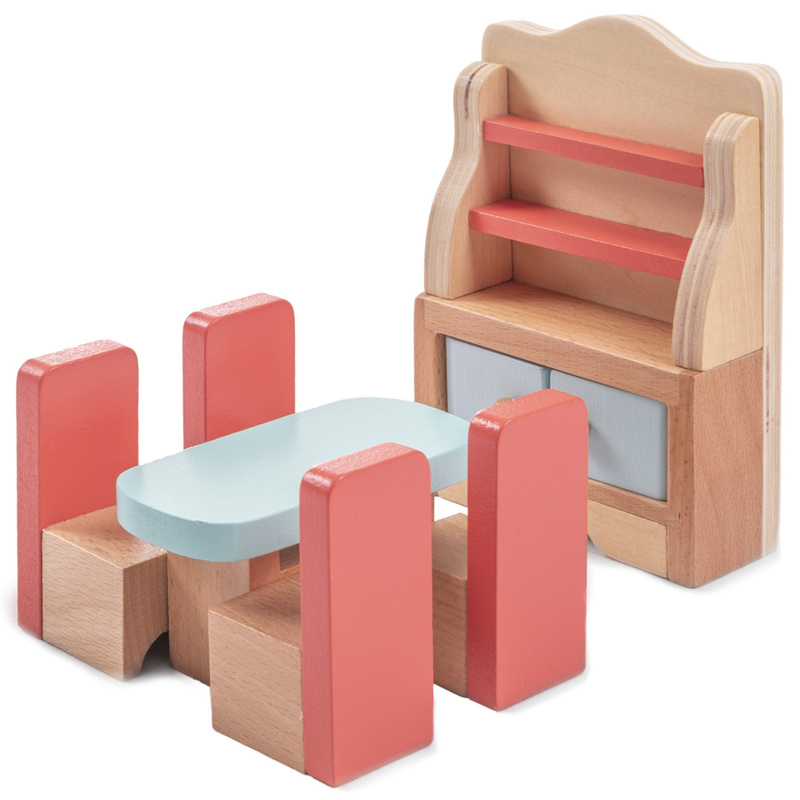 The Star Bright collection of wooden doll furniture from Imagination Generation features bold, chocolate accents and bright rainbow highlights. It's a decidedly different look for doll furniture! 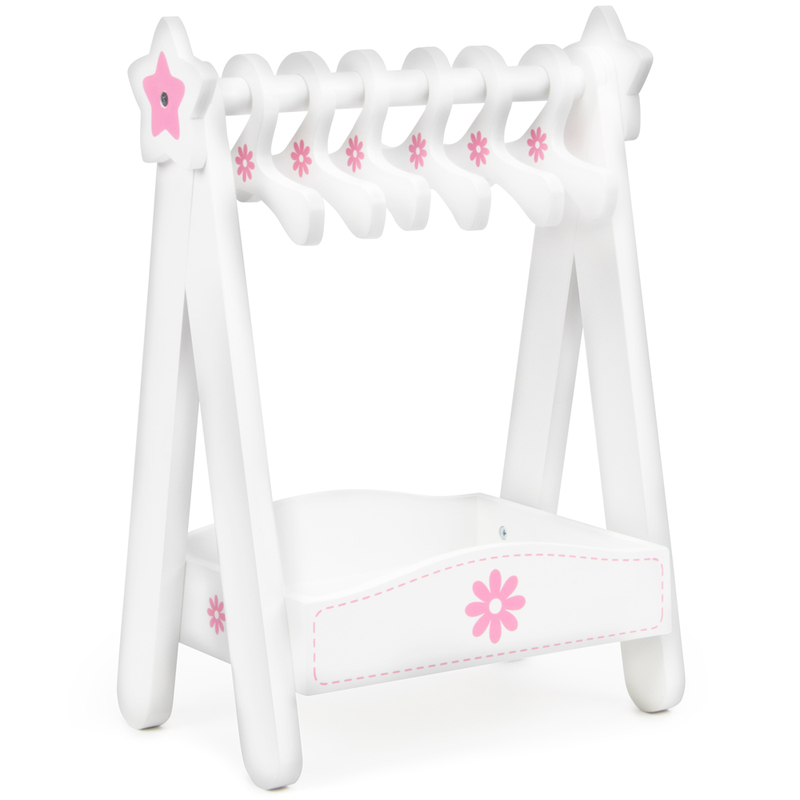 Comfortably accomodating a wide range of 18" dolls, inlcuding American Girl, Kid Kraft, Our Generation, Madame Alexander, Best Friends Club, Journey Girls and more, this comfy rocking cradle is the perfect vessel to sail your favorite dolls off to dreamland. Just lay your doll on the mattress and pillow, pull up the covers, and tuck them in! Assembly is quick, simple, and requires no tools or fasteners. Also available in our Star Bright line: Bunk Beds that turn into two twin beds, and a High Chair for feeding time! Dancer Girl M.C. (her full name is Maria Camila!) is a soft, 14" plush cuddle companion with thick, richly textured velvet hair. She comes with her very own backpack and towel. In her illustrated storybook "One Step a Time" M.C. has to memorize a zillion dance steps! Find out what happens, and learn fun facts about dancing, too! Gymnastics Girl Maya is a soft, 14" plush cuddle companion with thick, richly textured yarn hair. She comes with her very own backpack and towel. In her illustrated storybook "Becoming Brave" Maya learns to be brave before a big meet. Find out what happens, and learn fun facts about gymnastics, too! Cheerleader Girl Roxy is a soft, 14" plush cuddle companion with thick, richly textured yarn hair. She comes with her very own backpack filled with bright yellow pompoms and a towel. In her illustrated storybook "Leading the Way" Roxy learns what being a leader really means. Find out what happens at the cheer competition, and learn fun facts about cheerleading, too! Meet Flatter. He's clumsy and awkward and thinks that people's thoughts create our reality. 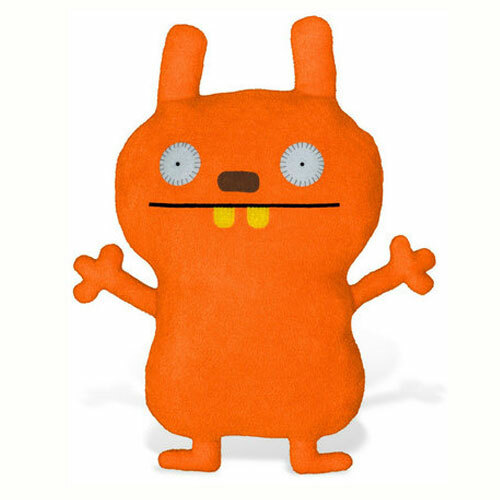 UglyDolls are artist-created, super-soft stuffed animals designed to inspire creativity and show us that being ugly means accepting our differences and embracing our flaws. In 2006, UglyDolls were named the specialty toy of the year by the Toy Industry of America. Made of ultra-soft polyester, Flatter should be hand washed and is recommended for children of all ages. Go! Go! Sports Girls are new and improved for 2016! Each new doll has been redesigned to look more like her illustrated counterpart with higher-quality, more detailed costumes. Story time and play time are one and the same with this Read & Play set from Go! Go! Sports Girls. A fun and educational way to promote self-appreciation and the benefits of daily exercise, smart eating and sleeping habits, the books and dolls in the series encourage all children to dream big and work hard to achieve their goals-and have fun while doing so. Runner Girl Ella is a soft, 14" plush cuddle companion with thick, richly textured yarn hair. In her illustrated storybook "Family Fun Run" Ella learns to love running as she earns dog-walking money toward getting her own dog! How big will her business get, and will she ever get her own dog? Read on to find out! 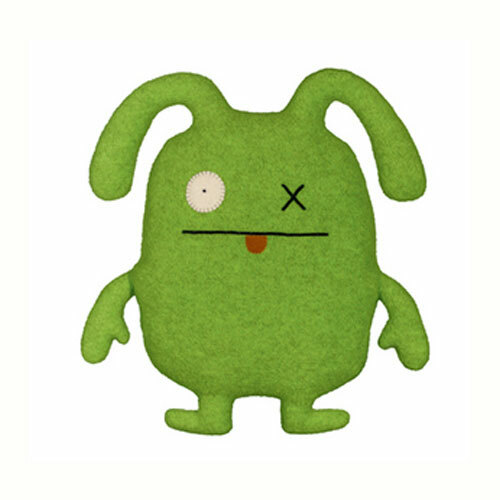 Meet Uppy, a super-positive UglyDoll who is always optimistic. Uppy is positive that the snack you have in your hand is his, and that your bank account should be in his name. Make Uppy happy and go to the bakery for a delicious treat. Made of ultra-soft polyester, Uppy should be hand washed and is recommended for children of all ages. Meet UglyDog. He likes to help himself to snacks. He also likes to help you and is the ultimate pet. But he doesn't like to beg, or fetch, or roll over. Made of ultra-soft polyester, UglyDog should be hand washed and is recommended for children of all ages. 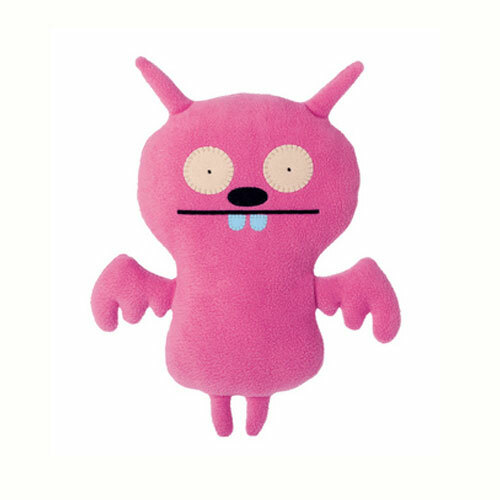 Meet Gragon, the little fuchsia UglyDoll who is who she is, and wants you to be who you are. Made of ultra-soft polyester, Gragon should be hand washed and is recommended for children of all ages. Meet Cozymonster, the loveable orange monster who is constantly bothered with crazy questions and other people's problems. 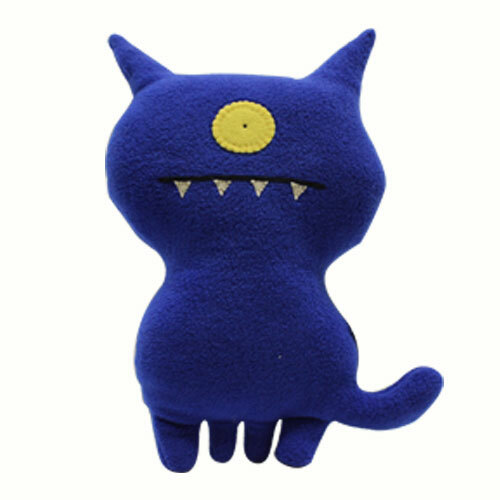 Made of ultra-soft polyester, Cozymonster should be hand washed and is recommended for children of all ages. Meet Ket. He likes UFOs and chocolate. He's no dummy. After all, he has you for a friend, right? Ket's motto is simple, "Do the math." Made of ultra-soft polyester, Ket should be hand washed and is recommended for children of all ages. Meet Ninja Batty Shogun. He thinks Nijas are rad. He flies around at night in an actual ninja costume. He is in straight-up stealth mode. Made of ultra-soft polyester, Ninja Batty Shogun should be hand washed and is recommended for children of all ages. 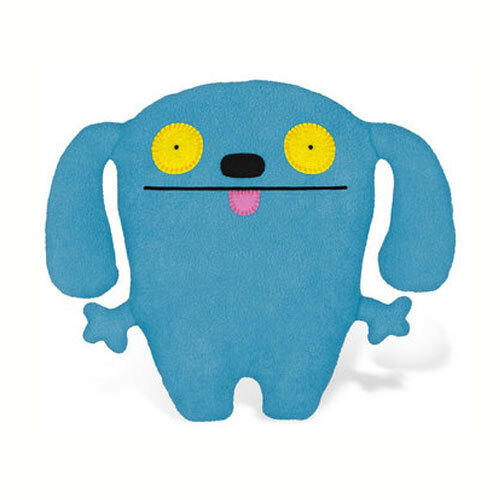 Meet OX, an UglyDoll whose name stands for hug and kiss. OX wants to steal your heart, and borrow all your stuff. OX gives hugs with his ears, but he isn't a great listener. Made of ultra-soft polyester, OX should be hand washed and is recommended for children of all ages. Colors may vary. 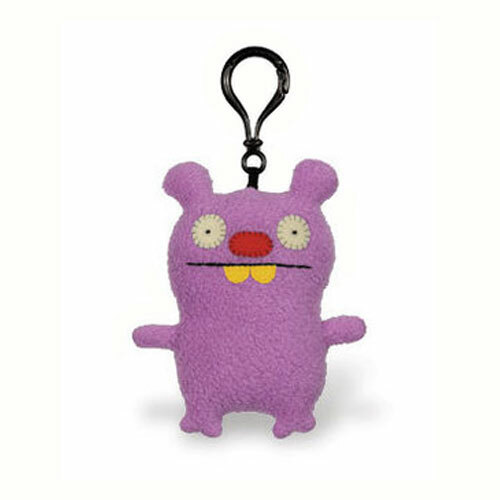 This UglyDoll Trunko keychain is the perfect way to decorate any backpack, home or office space. Trunko freaks out about everything. Overreacting is his hobby. Please be patient with him. Made of polyester fibers, Trunko should be surface washed and recommended for ages three and up. 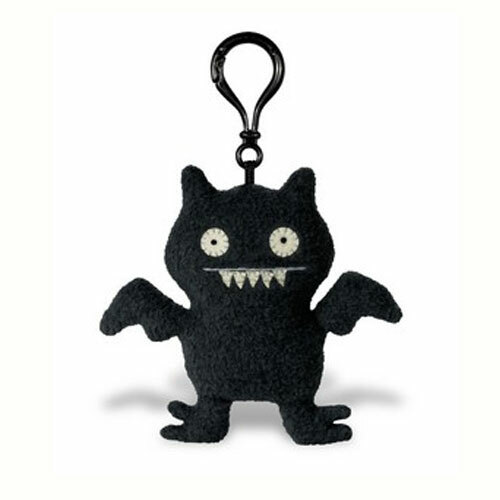 This UglyDoll Black Secret Mission Ice-Bat keychain is the perfect way to decorate any backpack, home or office space. Black Secret Mission Ice-Bat lives in the freezer and wants the snack foods and cookies you've been eating. Made of polyester fibers, Black Secret Mission Ice-Bat should be surface washed and recommended for ages three and up. 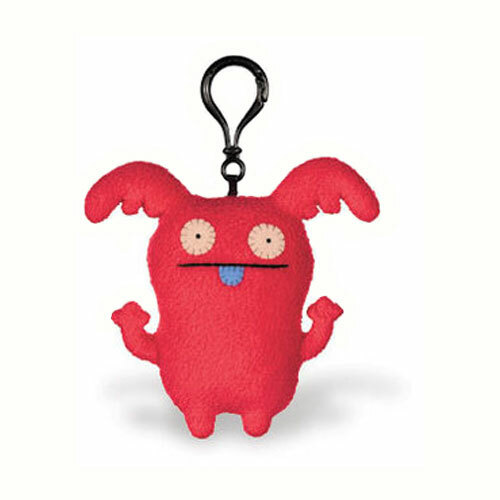 This UglyDoll OX keychain is the perfect way to decorate any backpack, home or office space. OX's name stands for hug and kiss. OX wants to steal your heart, and borrow all your stuff. OX gives hugs with his ears, but he isn't a great listener. Made of polyester fibers, OX should be surface washed and recommended for ages three and up. 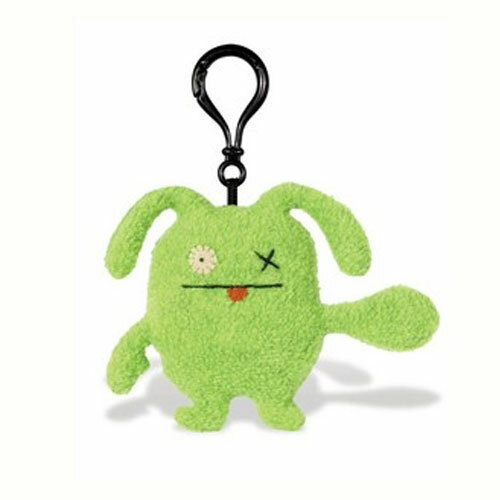 This UglyDoll Uppy keychain is the perfect way to decorate any backpack, home or office space. 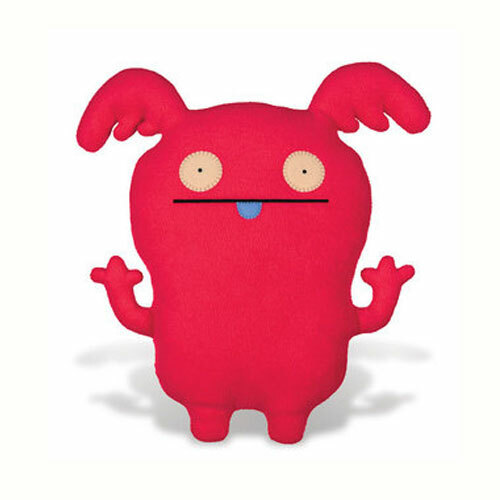 Uppy is a super-positive UglyDoll who is always optimistic. Uppy is positive that the snack you have in your hand is his, and that your bank account should be in his name. Make Uppy happy and go to the bakery for a delicious treat. Made of polyester fibers, Uppy should be surface washed and recommended for ages three and up. 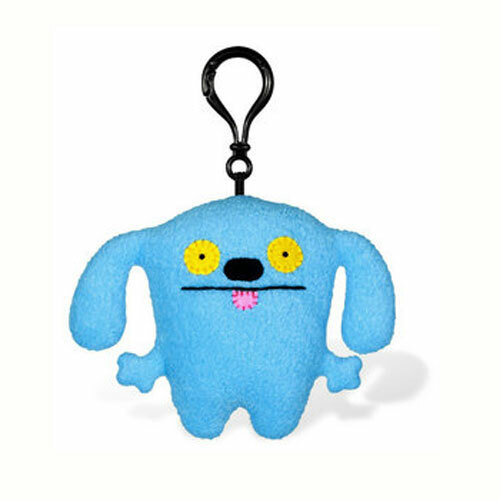 This UglyDoll Ket keychain is the perfect way to decorate any backpack, home or office space. Ket likes UFOs and chocolate. He's no dummy. After all, he has you for a friend, right? Ket's motto is simple, "Do the math." Made of polyester fibers, Ket should be surface washed and recommended for ages three and up. 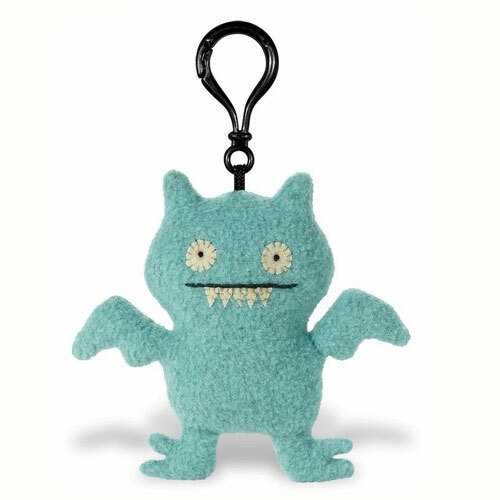 This UglyDoll Ice-Bat keychain is the perfect way to decorate any backpack, home or office space. Ice-Bat lives in an ice box inside an ice cave, yet he wants to warm your heart. Perfect for people on the go, Ice-Bat is ready to travel. 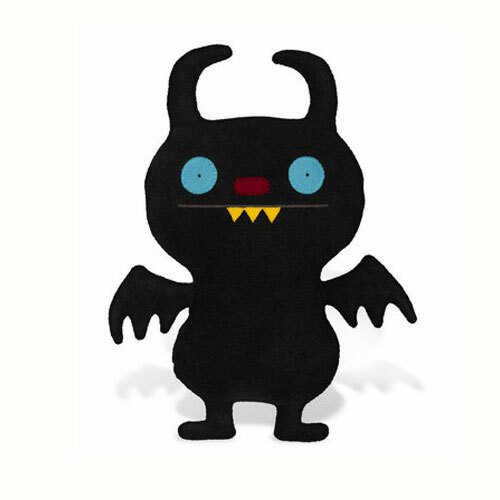 Made of polyester fibers, Ice-Bat should be surface washed and recommended for ages three and up. Wedgehead has his eye on you and he likes what he sees. He knows exactly what you mean. Of course he has to stand on his head to do so...but he totally gets it. Wedgehead needs something. You know that pocket change you've been saving? Yeah, Wedgehead kinda needs it all. OX's name stands for hug and kiss. OX isn't a very good listener, but he is great at magic and his best trick is turning your stuff into his stuff. 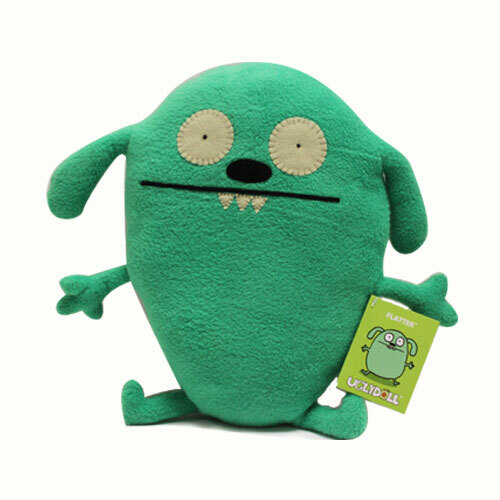 Part of the UglyDoll UglyBuddies series, these silly creatures make a perfect gift idea. Buddies are designed to have your back after a bad dream, or when it's dark, or when the cookie jar is empty. They are there for you to share the good times, like barbeques, kicking a ball around and riding in the cart at the supermarket. Need help rude people? Buddy has your back. Need help with homework? No! See, your buddies are there like 90 percent of the time, but they are 100 percent behind you as you work hard to make your dreams come true and do what you love. Ok, now get in the pouch! Wedgehead is blue and measures approximately 9 inches tall. OX is green and measures approximately 4 inches tall. Made from soft, all new polyester fibers, these items should be hand washed and are recommended for children ages 3 and up. 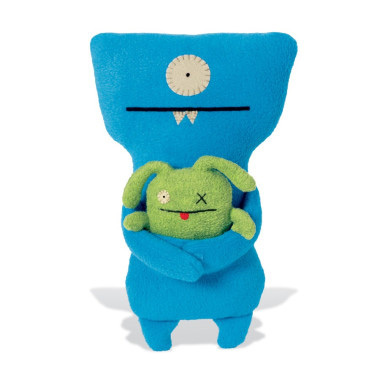 UglyDolls are artist-created, super-soft stuffed animals designed to inspire creativity and show us that being ugly means accepting our differences and embracing our flaws. 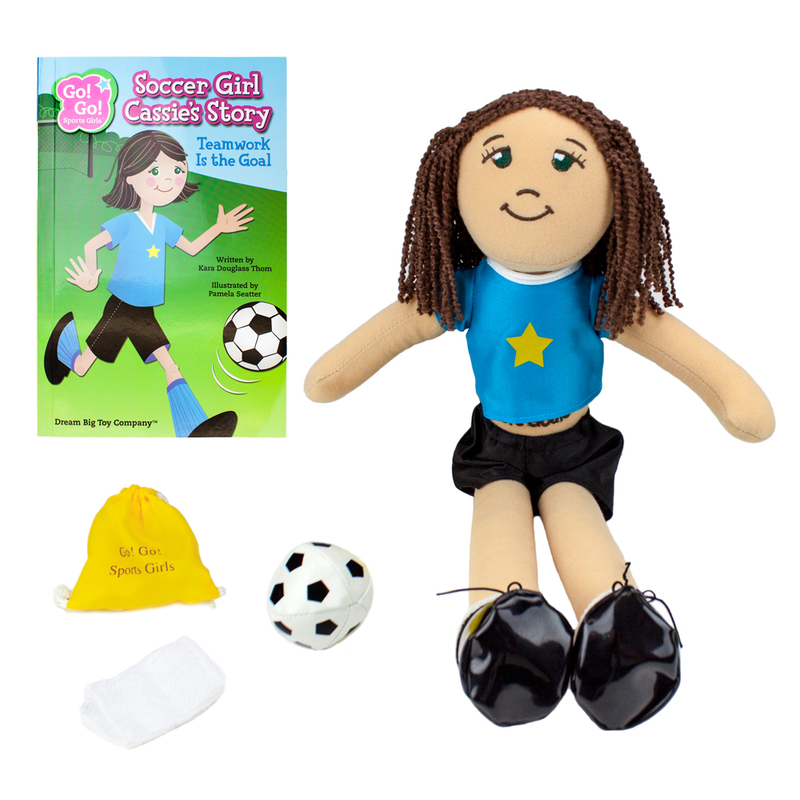 Soccer Girl Cassie is a soft, 14" plush cuddle companion with thick, richly textured yarn hair. She comes with her very own backpack filled with a soccer ball and towel. In her illustrated storybook "Teamwork Is the Goal" Cassie must compete against her best friend Anna! Find out who wins the big game, and learn fun soccer facts, too!